sharing many of the same technical aspects. with the support of the Koishiwara-yaki school of pottery based in Fukuoka prefecture. a noted master of realism, working as his assistant during photography for A Pilgrimage to Ancient Temples and other publications, during which time he stayed in Kyoto. It was here, in the ancient capital, that Kyo-u first came across a tenmoku tea bowl; the meeting was to prove pivotal. Kyo-u became captivated by the desire to one day craft a similar tea bowl himself, and this led him to establish a pottery on Yoron island, at the time the southernmost island of Japan. As he was preparing to open the pottery, he began to experiment, making a number of prototypes in a small kiln. He gathered a variety of mineral ores, mostly from the area of Japan previously known as Ryukyu, and used them in his glazes. When just a young child, Kyo-u’s son, Haruhiko Kaneko, would play with the bottoms of milk bottles, pretending they were spectacles. He begged his father to used them in his pottery, so Kyo-u eventually agreed. He had thought that the glass would simply be adhered to the ceramic material after firing. 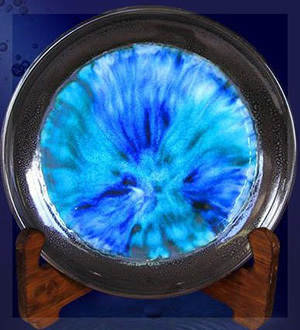 What actually happened was the transparent glass took on a pale blue colour in the firing process. Today, we know that it is the metallic content of the glass which gives off colour, but at the time there were no ceramic artists anywhere in the world working to combine glass and pottery. That moment was the first time that anyone anywhere in the world had succeeded in fusing glass, its integral colour brought out through firing, and ceramic material. 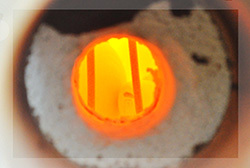 Over the next six years, Kyo-u worked to perfect the technique, and thus the Yoron-yaki pottery was born. I live on an island which enfolds me in its magnificent ocean panorama of marine blues and emerald greens, shimmering under the golden light of the sun. To me, this oasis, this ocean is everything; it is the source of life. I can only be grateful to nature and to all of its bounty?the beauty of the flowers in bloom and of the birds in song. 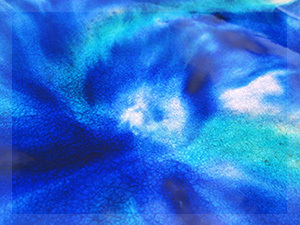 Out of love for this wonderful nature, out of thanks to all of the people who visit the Ishigaki Pottery Studio from across the world, and out of gratitude to all of those people throughout Japan and beyond who have supported us, it is my wish and my intention to communicate the unsurpassed beauty of these Okinawan waters to the people of the world through my pottery. The sea constantly changes; it is different on each day of the year. There is a deep, natural beauty to the sea, more profound than anything crafted by human hands. That beauty stretches out endlessly, surrounding us fully, yet sadly we will never be able to grasp that beauty adequately or to express it. As humans we are prone to emotion and to awe. And what we can do is try to retain that sense of awe in our minds. At Ishigaki Pottery Studio I try to retain the awe that I feel every day, not by recording my memories on photographs or CDs, but rather filtered through my own emotional response into the pottery I produce. Scattered throughout my Ishigaki pottery pieces are the themes from the natural world which inspire me every day. Each piece is crafted with great care. Ishigaki pottery is best appreciated by taking it in the hand to examine and enjoy. The Ishigaki Pottery Studio was named after its location, Ishigaki, so that the world might come to know the name of this beautiful island. In 1964, my father Kyo-u discovered the beauty and potential in combining glass and pottery. 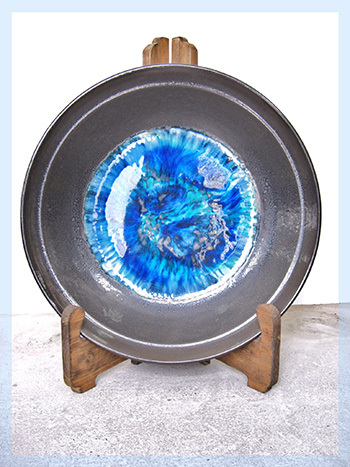 Using powdered mineral ore and translucent glass, he created a unique style of ceramic art, decorated with glass transformed into the shimmering colours of the Okinawan sea and delicate yuteki tenmoku glaze. With these two techniques in mind, I founded Ishigaki Pottery Studio in 1999 on Ishigaki island, a location rich in the mineral resources needed to create Ishigaki-yaki pottery. Pottery can survive for thousands of years, so my work shall remain long after I am gone, communicating my message in my absence. It is also my wish that my pottery should depart from Ishigaki, travelling all over Japan and the world, and that they should continue to travel, passing into the hands of gallery owners and collections, bringing joy to all who look upon them. The fusion of glass with ceramic material was long thought impossible, due to the significant difference in the extent to which the materials contract. As such, combining the two materials in a single piece was seen as something of a fantasy (glass expands up to 1300 degrees then begins to harden and set as the temperature drops. Pottery will contract until around 100 degrees, so the glass and the ceramic material adhered to the glass tends to crack along with glass). When this technique first began to be used in the production of tableware, in around 1970, only one plate out of every two hundred would be successful; I remember the piles of cracked plates that were testament to the difficulty of the technique. Today, the rate of success is gradually rising. But consider the properties of the yuteki tenmoku glaze and the integral colour of the glass, and it becomes clear that while they might be intended as tableware, items of this quality are still incredibly rare. For those pieces I produce as decorative art, the success rate is lower?perhaps one in several hundred or a thousand pieces?as I continue in my in pursuit of ever greater technical challenge. There are some pieces of which I shall succeed in creating only a handful in my entire lifetime. So if you love a piece, I recommend buying it then and there. There are many pieces which I shall never succeed in recreating, as a result of the unique discoloration arising from the iron-based glaze I produce. In the past, many people in many places have tried to fuse glass with pottery. But these experimental pieces would crack and break; they were neither practical nor realistic. For this reason, metal came to be used instead of pottery as a base onto which to fire the glass. There are also many examples of pots and other items, in which coloured glass has been attached to the pottery as decoration. However, thus far I have seen no examples of ancient or medieval pottery decorated in this way known to have been used as tableware. After this, tiles made with a transparent glaze became the mainstream, commonly used in temples. The same can be said for tableware. This is an indication of just how laborious such ceramic items were to make for the potters of old. At one point, I did consider using techniques?such as the use of lead?which would soften the glass, but I have chosen rather to use hard glass in order to eliminate any possibility of adverse health impacts. The touch of the ocean that surrounds Okinawa is so wonderful that I was not able to think of a material better than glass to express the translucence and gradation of its waters. In order to produce a translucent glaze, the technique is to dilute silica stone with feldspar and wood ash and lime. In this way, the glass does show colour, but the technique did not allow me to express the contrast between dark and light that occurs as the depth of the water changes, the gradation of the ocean waters, or the intensity of the light given off by the ocean. Put simply, it did not allow me to express the life force which resides in the waters. This led to further creative challenges. I continued to try and refine my selection of clay, of cast, of firing conditions for the pottery and for the glass, of the type and hardness of the glaze, of the type of glass, and so on. After many thousands of attempts, at last, Ishigaki-yaki pottery was born. 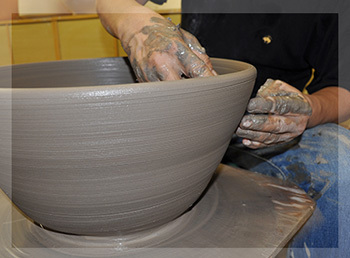 The pottery is the result of extremely time-consuming and intricate techniques; for example, the kiln is in operation for over a week in order to complete both pottery and glass firing. For fifty years, tireless efforts have been made in order to refine these techniques and overcome these challenges; the efforts remain ongoing today. 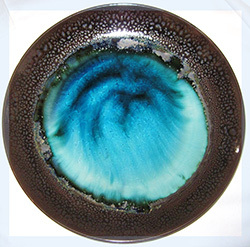 Forty-eight years ago, pottery which fused glass and ceramic material was unique and highly unusual. In general, humans do not react well to change in our everyday routines and values. We feel discomfort and try to rebel against that change. But once we begin to understand the nature of the change, our reaction turns from one of repulsion to one of awe. Even those who at first cannot or will not understand the change will come, over time, to realise the beauty and benefit of that which has changed, perhaps once it becomes widely accepted and used by respected people or in respected establishments. Fifty years ago, porcelain was predominant throughout the world, and in Japan both pottery and porcelain were in use, but of course the fusion of pottery and glass was considered quite impossible. Today, many people are aware of the shimmering marine blues and emerald greens of the ocean waters surrounding Tahiti, New Caledonia, and the islands of Okinawa. They can see these beautiful waters in high definition on their television screens, transporting them in an instant to these tropical beaches. A few years ago, there were also many people who believed that the combination of glass and pottery was an unwise and unnecessary one, and even that the colour of the ocean was nothing to be celebrated. Today, we understand that metal can give off a range of colours, but not long ago it was considered unfeasible that mineral ores could similarly produce colour. The gallery at Ishigaki Pottery Studio welcomes over 100,000 visitors a year. It is a delight to see so many of these visitors purchase tableware to decorate their homes or to use when entertaining special guests.